Over 9 weeks this summer, a judge of the B.C. 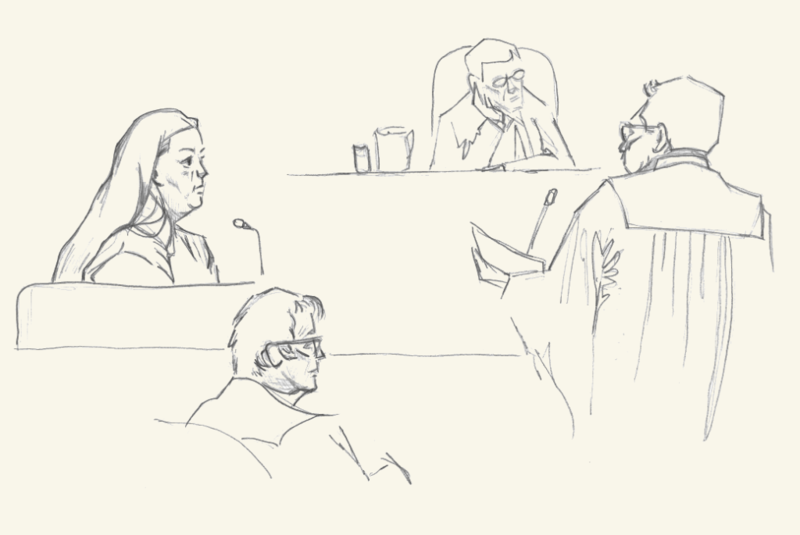 Supreme Court heard the BCCLA’s case challenging the use of solitary confinement in Canadian prisons. This lawsuit, brought jointly with John Howard Society Canada, began in 2015. Over the following two years, we collected evidence from experts from around the world who had documented the harmful effects of long-term isolation. We poured over dozens of reports issued over the last two decades from investigations and inquiries, all of which urged the federal government to stop the practice. We reviewed statistics documenting the disproportionate impact of solitary confinement on Indigenous prisoners, particularly Indigenous women. And, most importantly, we heard from people across the country who had been impacted by the crippling effects of solitary confinement. Their courage and candour became the heart of our case. 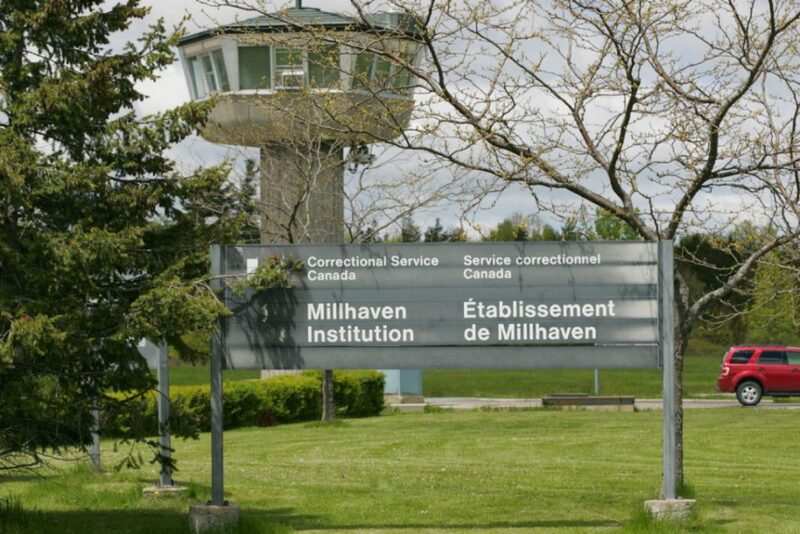 Andre Blair spent 363 days in a small cell in Millhaven Institution. For 23 hours a day, Andre sat in a dirty cell with a solid steel door. He had almost no interaction with other people. He couldn’t attend the classes he had been enrolled in to obtain his GED. He couldn’t see his family without a plexiglass barrier separating him from his wife and children. Andre felt abandoned. He felt totally alone, like no one was there to protect his rights. To Andre, prison guards and CSC officials could do or say whatever they wanted and would always win. Because no one would believe the convicted prisoner. Bobby Lee Worm is an Aboriginal woman of Cree heritage and a member of the Daystar Band in Saskatchewan. Her parents were intravenous drug users whose addictions often prevented them from caring for her and her brothers. She was abused as a child in every imaginable way. Her involvement with the criminal justice system began at age 12. By age 19, she was serving time in a federal prison. Bobby Lee spent 747 consecutive days in solitary confinement. She thought of killing herself. She hallucinated. She became overly sensitive to loud noises and large spaces. And most of all, she felt a profound sense of powerlessness. The same kind of powerlessness she felt as a child trapped in a home filled with violence and abuse. Rob Roy’s son Christopher called him every week from his solitary confinement cell. On the phone, Rob heard his son struggle with the isolation of solitary confinement, heard him slide deeper into despair. The second week of May 2015, those calls abruptly stopped. Two weeks later, Rob’s son hanged himself in his solitary cell. After Christopher’s death, Rob was heartbroken to learn more about his son’s life in segregation. He saw photos of the small cell Christopher had lived in. He imagined what it was like to have no natural light or fresh air. He imagined his son’s last days. Rob is not a scientist, a sociologist, a criminologist or any kind of expert. He is a parent who lives with loss, believing that his son’s death was entirely preventable had he not been placed into solitary confinement. These stories – and countless others – represent the cost of solitary confinement. It is simply too high a price to pay. The Court will likely issue its decision in the new year. We are hopeful that 2017 will be the last year in Canada’s history that anyone will be subjected to solitary confinement. 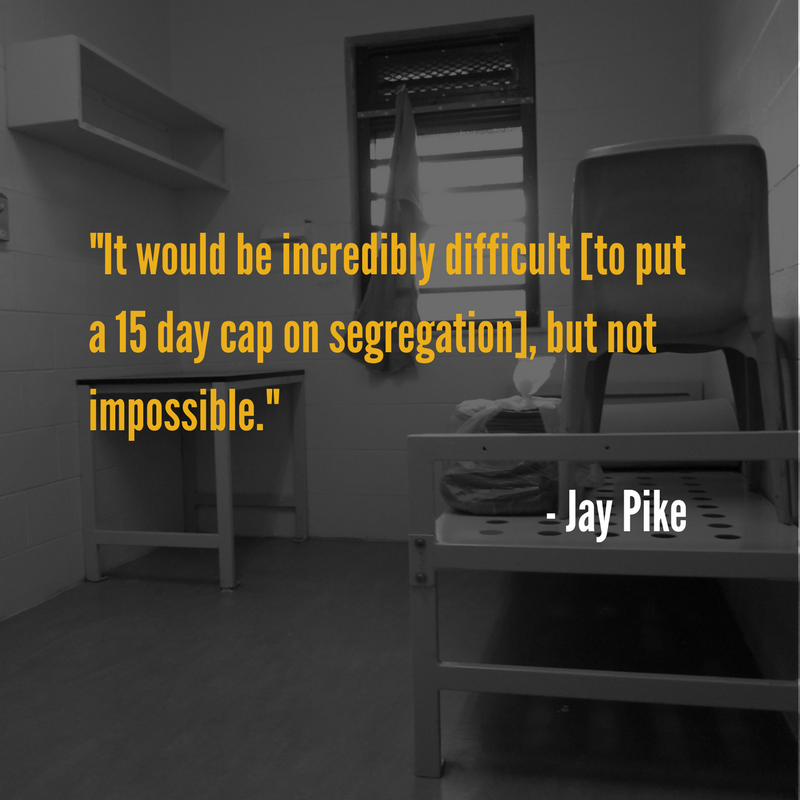 Mr. Justice Peter Leask, asked the witness, Mr. Jay Pike, a Correctional Service Canada (CSC) employee, to imagine a world where there is a 15-day cap on segregation. Mr. Pyke said that “it would be incredibly difficult, but not impossible”. He continued, noting that 15 days as a hard cap could be a difficult time line. Mr. Pyke described a hypothetical situation to illustrate when a 15-day hard cap would be difficult. The hypothetical was an inmate that commits a murder inside the prison. A 15 day, hard cap, of keeping that prisoner in segregation, could be too short of a time line for CSC to make decisions about which unit would be safe for the prisoner to return to, and to ensure the safety of other prisoners and guards. Additionally, there are procedural issues involved in this type of investigation that take time, such as determining which other prisoners were involved, and having witnesses participate in the investigation. Mr. Pyke said it is “hard to know what to do, especially when there are inmates who are difficult” or won’t cooperate with an investigation. Some prisoners refuse to leave segregation. Mr. Pyke said that CSC does not use force on prisoners who refuse to leave, but if the refusal continues, CSC may commence an involuntary interregional transfer of the prisoner to another institution. These kinds of transfers are common and are intended to put the prisoner to into an environment where they feel they can enter the general population, and no longer remain in segregation. Counsel for the Attorney General called Dr. Kelly Blanchette to testify in court today. 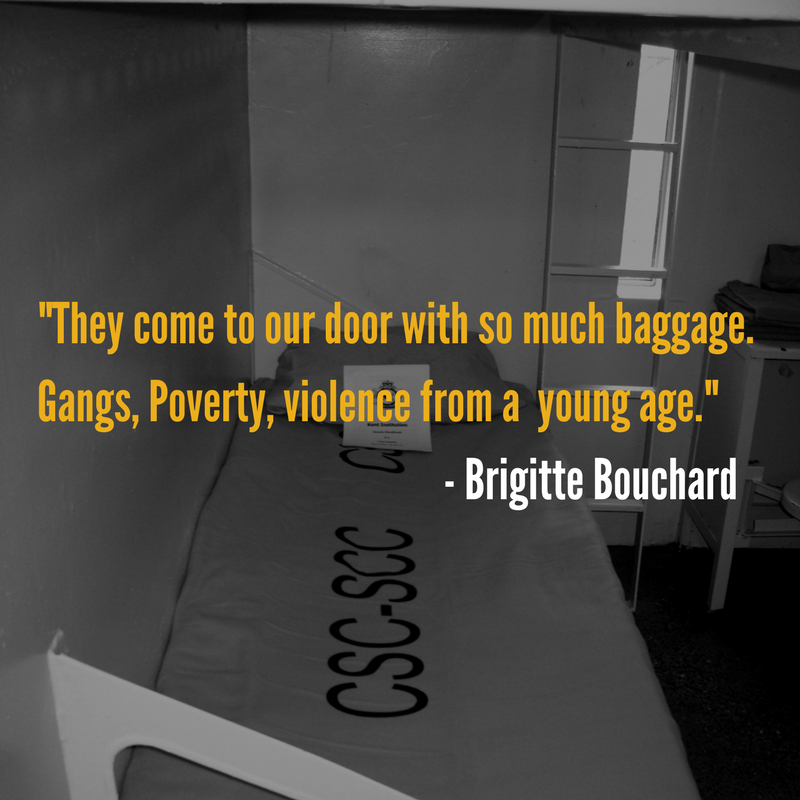 Dr. Blanchette started at the Correctional Service of Canada as a Research Officer in 1997. She has since been employed by CSC as the Director and Senior Director of Correctional Research, as well as the Director General of Mental Health. She is currently the Deputy Commissioner of Women. Dr. Blanchette spoke of the newly revised Commissioner’s Directive 843, titled Interventions to Preserve Life and Prevent Serious Bodily Harm. She detailed some of the new initiatives included in the revisions, which took effect on August 1, including the prohibition on inmates with serious mental illness being placed in segregation (and how such inmates are classified), better reporting on self-harm, and ensuring inmates are active agents in any interventions used against them. To the latter point, she explained that if correctional officers deemed that a situation required restraining an inmate, they would do so while explaining to the inmate why they are being restrained, and also ask the inmate if they have suggestions on how best to de-escalate the situation. In cross-examination, counsel for the BCCLA Alison Latimer put statements made in recent reports from the Office of the Correctional Investigator to Dr. Blanchette. Ms. Latimer asked if Dr. Blanchette and CSC agreed with the statement that isolation is a risk factor for suicide. “I don’t disagree” she replied, “but it requires context. More people with mental health issues are in prison. More young people are in prison. These are also risk factors for suicide. 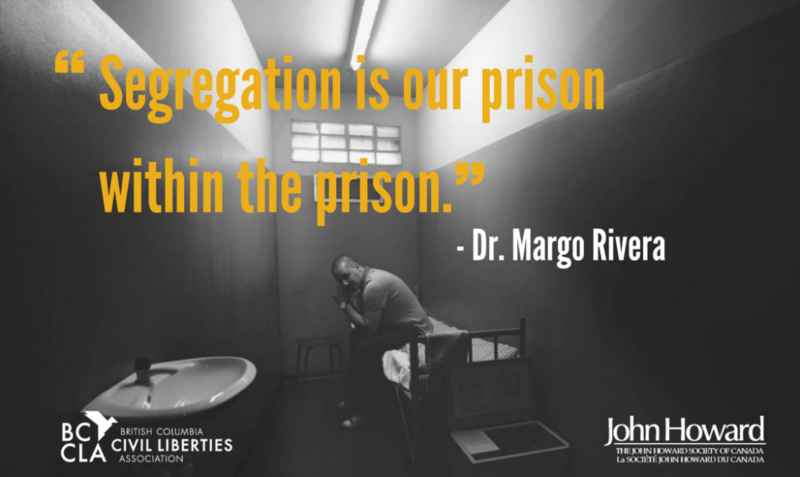 In segregation, you are away from your cellmate, so there is more opportunity to hurt yourself. Isolation has a correlation, but not a causation with suicide in prison”. 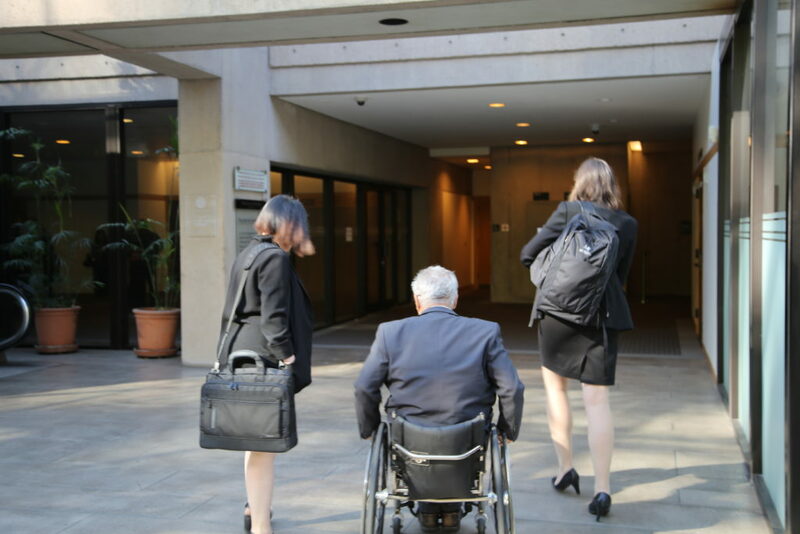 Dr. Brie Williams gave evidence on administrative segregation and physical health, especially for older prisoners with chronic medical conditions or physical disabilities. Dr. Williams takes the position that prisoners with significant mobility impairment should not be in segregation because it is detrimental to their physical health. Those who rely on a walker, cane, have a gait imbalance etc. are at a higher risk of falling, which contributes to a higher rate of death in older adults. To avoid falls, older adults need to have as much access to exercise as often as possible; an amount of access that currently isn’t available in segregation units. A person in a segregation cell can do stationary exercises such as stretching, muscle toning, squatting, but there isn’t really much for cardiovascular exercise. Running on the spot is one option, but if the individual has balance problems, this limits their ability to exercise in their cell. Mr. Mitch Taylor, counsel for Canada, brought to Dr. Williams attention her report which stated that 2.5 hours per week is enough to maintain health. 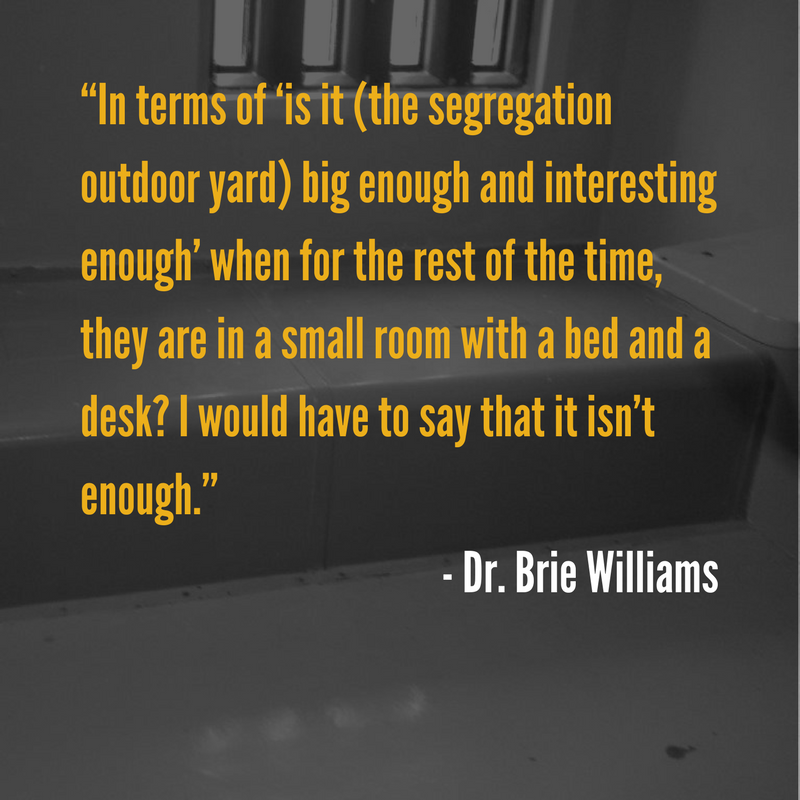 Dr. Williams elaborated on this statement by noting: although this is the basic requirement for what is needed to maintain health, the average person is completed more exercise and movement throughout the day than those who are sitting in a segregation cell. 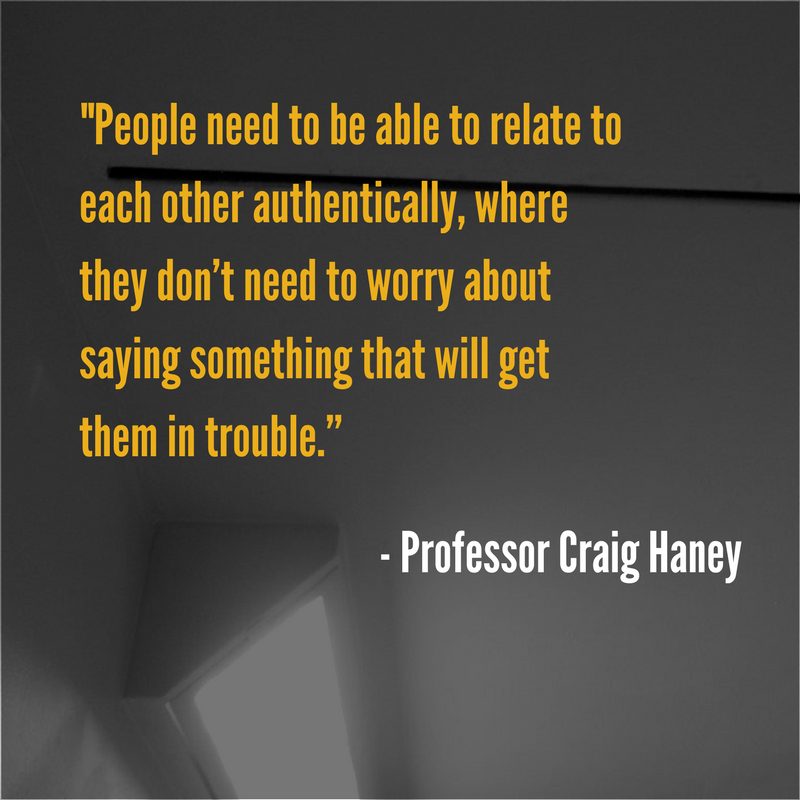 Professor Craig William Haney gave evidence in court today. The court found him to be qualified to give evidence on his academic specialization in psychology and law, his expert opinion on the psychology of imprisonment, and the current state of the law and practice in the United States. Professor Haney discussed research he has done in segregation units. He highlighted that one of the main problems with this type of research is that prison environments, or segregation units, are not research labs. Corrections staff will always override methodological decisions where the person conducting the experiment may have chosen to do something different. Earlier, he noted that in the context of solitary confinement, meaningful social contact is not achieved through bars and windows in an authentic way. Usually, meaningful social interaction is achieved when the activity is social in nature, is meaningful, and not bound by the fixed relationships that exist between prisoners and staff; “The difference is, in segregation, it’s the only kind of interaction they have”. Today, BCCLA witness Daren Frick took the stand. He was employed from 2007 to 2012 as the Assistant Warden of Management Services at Edmonton Institution (EI), a maximum security penitentiary for men. He is currently employed at the Edmonton Remand Centre as a Manager for Finances and Administration. 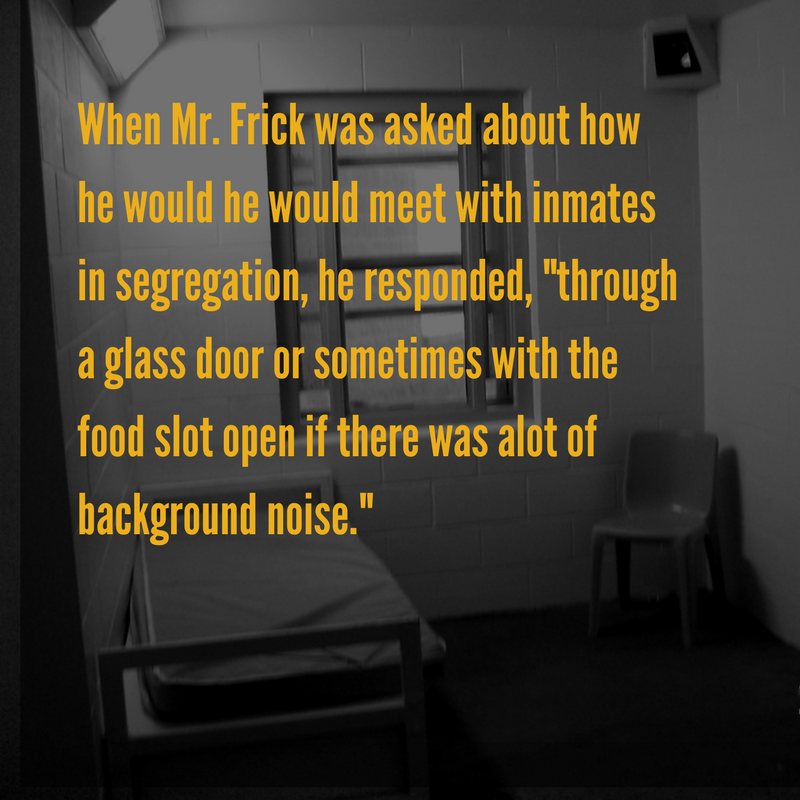 In his written evidence provided to the court, Mr. Frick spoke to his observations in federal prisons, of such things as the conditions of confinement in segregation and the impact of segregation on aboriginal and mentally ill inmates. Mr. Frick described the conditions of confinement in maximum security institutions as “very punitive”. Mitchell Taylor, Lead Counsel for the Attorney General, asked Mr. Frick about how he would meet with inmates in segregation during his employment at EI. “Through the glass door” he replied, “or sometimes with the food slot open if there was a lot of background noise”. During these meetings and his employment in general Mr. Frick observed that prisoners in segregation were given limited access to basic amenities such as television and radio. “I don’t know whether there was a rule against them” he said, “but I’d never seen an inmate with a radio or television in a segregation cell”. Ms. Brigitte Bouchard gave evidence in court today on aboriginal initiatives and the application of aboriginal social history. Ms. Bouchard began her career at Correctional Services Canada (CSC) in 1998 as a correctional officer in Quebec, and was later promoted to Warden at the Edmonton Institution for Women, where she currently works. Ms. Bouchard agreed with several statements put to her by Ms. Alison Latimer, counsel for the BC Civil Liberties Association (BCCLA), including that the federally sentenced Aboriginal population exceeds 35%, the federal system holds Aboriginal people longer than their non-Aboriginal counter parts, and that the number of Aboriginal women in custody has increased by over 50%. Gladue reports are documents, prepared for some Aboriginal offenders that assess the offender’s individual and social Aboriginal history. These documents assess any trauma or intergenerational effects for the individual, and provide specific cultural and community focused information to the courts when sentencing an Aboriginal person. Ms. Latimer suggested that an Aboriginal person’s Gladue factors do not play any part in determining how long an individual should remain in segregation. Ms. Bouchard said that she hasn’t seen a Gladue report, and that she is not convinced that it would be appropriate for a decision maker (correctional officer) to have access to an individuals (prisoners) entire history of trauma. When asked why there are more Aboriginal people in segregation than any other race, Ms. Bouchard said they “come to our door with so much baggage. Gangs, poverty, violence from a young age”. 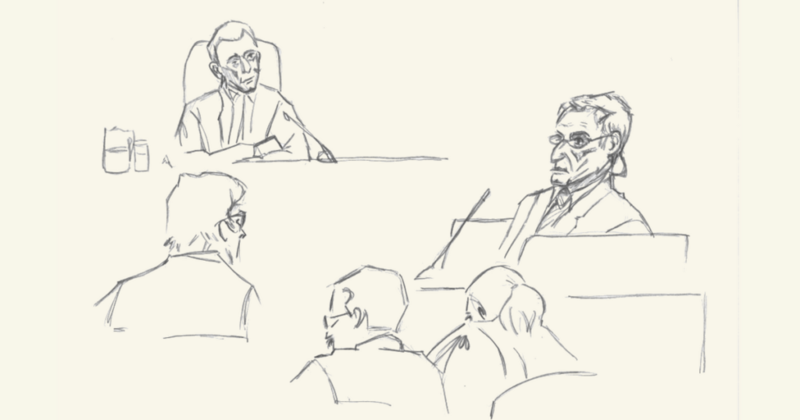 Today, BCCLA Counsel Joe Arvay continued his cross examination of Bruce Somers. Mr. Somers was called by counsel for the Attorney General to act as the main representative witness of the Correctional Service of Canada (CSC). Early in the examination, Mr. Arvay asked whether it was indeed that case that CSC’s continuing goal was to greatly reduce and ideally eliminate the use of administrative segregation. Mr. Somers replied that this “has always been our goal”. Mr. Arvay went on to ask what CSC’s position was on having an independent adjudicator with final decision making power for segregation placements that are over 15 days. “I’m not sure about their having the final call” said Mr. Somers, “but we would welcome their council and advice. I am struggling with who that person would be, though. Who would have that power over the Warden, who knows the institution best. 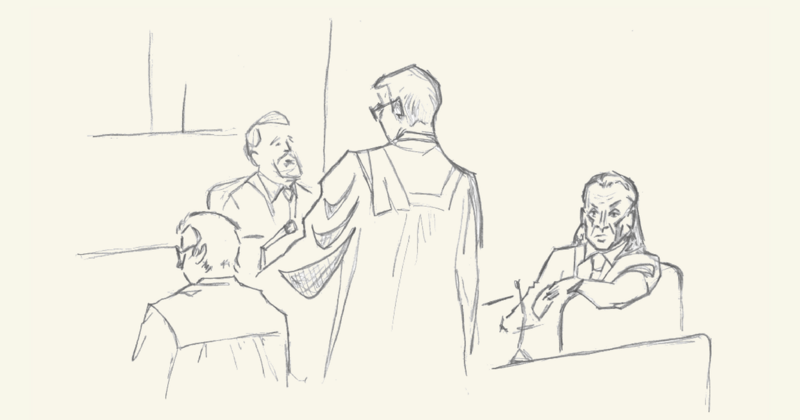 Bruce Somers, who is acting as the Correctional Service of Canada’s (CSC) key representative witness in this case, continued his testimony today. In the closing minutes of his direct examination, he spoke briefly to CSC’s core values, including the belief that prisoners should be assisted in becoming law abiding citizens prior to their return to the community, and that a common respect should be given to all individuals involved in the prison system. Counsel for the BCCLA Joe Arvay began his cross by asking whether CSC continues to hold the position that their use of administrative segregation is not in fact equivalent to solitary confinement as held in the Mandela Rules. 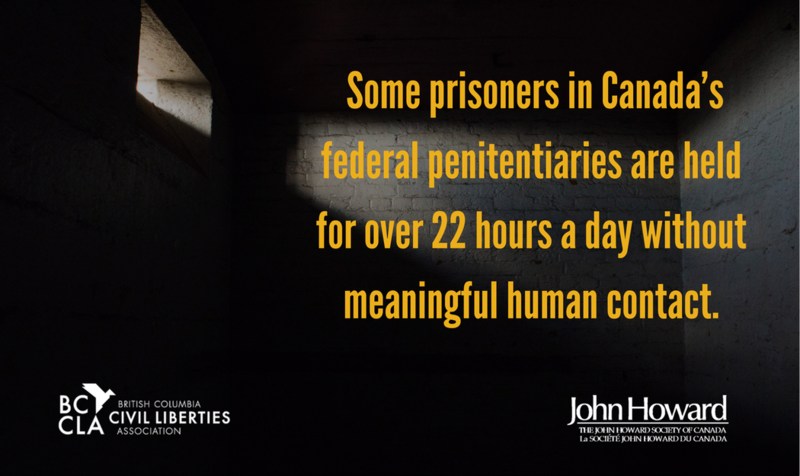 Mr. Somers agreed that this was the case, rejecting the claim that some prisoners in Canada’s federal penitentiaries are held for over 22 hours a day without meaningful human contact. Mr. Arvay then went through the average day in segregation, as it was laid out in the written evidence of Mr. Somers – from the meals provided through a food slot, the times between meals spent alone and locked in a cell, the one hour of yard time that may or may not be spent with another prisoner, the shower, and visits by other staff including the warden. He challenged Mr. Somers on the notion that such a schedule could possibly include meaningful human contact. Mr. Somers replied that the visits by staff members such as psychologists, chaplains and indigenous elders, as well as occasional visits from family members and others, does indeed fulfill the need for meaningful human contact. Mr. Arvay underscored the documented infrequency of these kinds of visits as a response to this. In reply, Mr. Somers said: “My position is that they receive quite a lot more contact than what we have discussed as the schedule today – that is why it is not solitary confinement”. Canada opened their case this morning with Mr. Bruce Somers. Mr. Somers began working with Correctional Service Canada (CSC) in 1983 and has held many different positions in his time there, including managing the segregation unit and Deputy Warden, until his retirement in July 2017. Mr. Somers gave evidence from his time as Deputy Warden, noting that he would make rounds in the segregation unit every day and talk to any prisoner who wanted to talk to him, while at the same time conducting a cleanliness inspection of the unit. He said it was typical that prisoners would want to chat with him as warden, and that if circumstances called for it, he would take the prisoner into a private room to have their discussion. Throughout the day counsel for Canada examined Mr. Somers on a number of changes that are being made to how CSC operates. 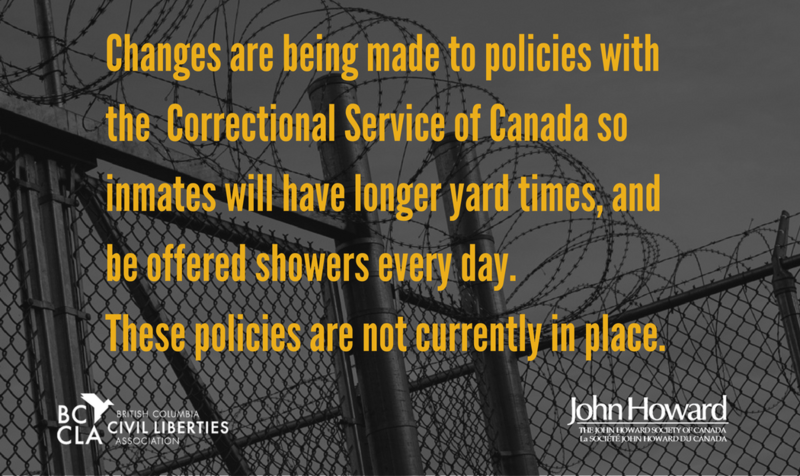 Changes for segregated inmates would include: receiving their personal belongings within 24 hours, longer yard times, showers offered every day, and upgrading some segregation cells to have windows. Dr. Andrew Coyle testified in court today. Dr. Coyle has worked as a governor (equivalent to a warden) of three penitentiaries in the U.K. He was qualified by the court as an expert on the management of prisoners who require high supervision, international standards on the use of solitary confinement, and strategies for avoiding or minimizing the use of solitary confinement. When asked by counsel for the Attorney General about his role as governor, he said: “my challenge was to bring a degree of humanity to these prisons”. Dr. Coyle testified that while he was Governor of Peterhead Institution, he would go to each individual cell in the segregation unit in order to visit the prisoners individually. “This was my statutory duty” he said, “but it was also part of my strategy to convince the staff that they should be doing the same – creating meaningful human contact for the prisoners”. Dr. Coyle heavily emphasized the importance of meaningful human contact for prisoners who require high supervision, calling it much more important than the “alternatives” to human contact, such as television and radio. During his time as Governor, Dr. Coyle strove to ensure that prisoners requiring higher supervision would have such interactions with at least 1, but preferably 2 or more individuals every day. He testified that this interaction was not through a food slot, but rather with the cell doors fully open, face to face. This, he said, was how the interaction became meaningful, and truly helpful to the prisoners. “Because they couldn’t keep me in a foster home, they decided that the best thing for me was to keep me incarcerated” – said Ms. Amanda Lepine, today’s witness, as she recounted her youth in the care of Manitoba Child and Family Services and the jail system. Counsel for Canada conducted an in depth review of Ms. Lepine’s youth and adult incarcerations and convictions. Ms. Lepine was incarcerated in a youth jail at the age of 12, and at the age of 14, she was transferred to an adult facility. She remained there until her release at the age of 19. Ms. Lepine spent time in segregation as a youth. She recalled being segregated for a period in an adult men’s ward: “I was in my own cell, but there were adult men all around me”. As an adult, she has been incarcerated twice, both times at a federal institution. During both placements, she was segregated several times. As Canada went through these placements, Ms. Lepine said each time, it was always on an assumption; all of the charges ended up being dropped. Ms. Lepine was asked to elaborate on why she refused yard time on several occasions during her segregation. Ms. Lepine explained that she was given her shower at 7:00am, and would only be offered yard time right afterwards. Often she wouldn’t want to go outside in the winter because her body and hair were still wet and she didn’t want to get sick. The warden declined to change her yard time so she could have both a shower and go out to the yard each day. Explaining to the Court the circumstances of her institutional charge of disobeying an order, Ms. Lepine said she walked ‘the loop’ with other inmates in protest of their treatment during an investigative lock down. “We weren’t given food, or allowed out. We weren’t given pads or tampons. On the 8th day we asked the wardens [for these items, and] they said they had no time”. Dr. Margo Rivera testified in court today. As a psychologist, Dr. Rivera acted as a consultant to the Correctional Service of Canada (CSC) from 2005 to 2010. She supported the CSC in the management of their most severely mentally ill prisoners who were also in long term (over 90 days) segregation. She provided assessments and recommendations on how to secure releases from and alternatives to segregation for these prisoners. In this role, she also acted as the psychologist on the team tasked with investigating the suicide of Ashley Smith in solitary confinement in 2007. Dr. Rivera described the role of that team as ensuring “that kind of thing would never happen again”. Dr. Rivera’s evidence was based largely on a 2010 report she authored entitled “Segregation is Our Prison Within the Prison”, in which she examined several long term placements of mentally ill prisoners into solitary confinement. She spoke of prisoners with severe forms of schizophrenia, personality disorder, and bipolar disorder. When asked by counsel for the Attorney General why there were relatively few of these severe cases documented in her report, Dr. Rivera replied that prisoners who were that sick would most often be transferred to regional treatment centres. “But once they would get a little bit more stable on medication”, she said, “they would be transferred back to segregation”. Dr. Rivera was also asked about prisoners who have asked to be segregated for their own safety. She replied that there should be a wider range of resources available in federal penitentiaries, whereby prisoners can access a space in which they will not be hurt ,but also where they will benefit the most. “That is the responsibility of CSC”, she said, “to both the prisoners and to the general public”. 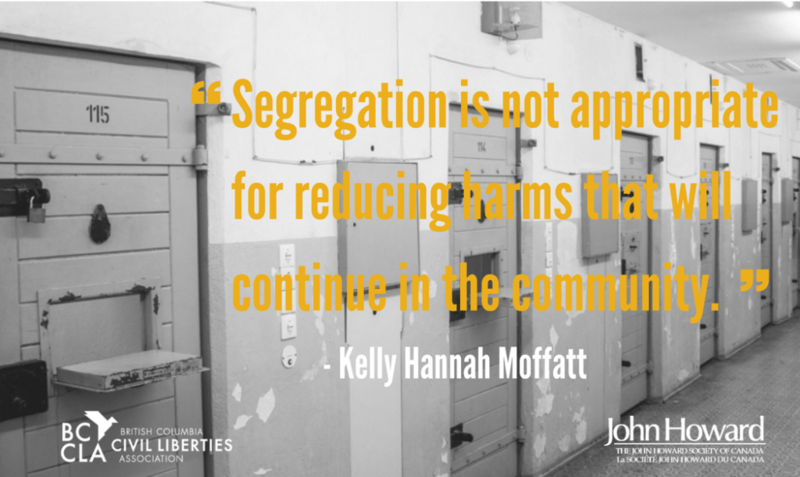 Dr. Kelly Hannah-Moffatt gave evidence in court today on how people are affected by segregation, highlighting that there are special circumstances—such as gender and race—that play a part in shaping inmate experiences. Dr. Hannah-Moffat has a wealth of experience, both researching and working with prisoners as well as with CSC (Correctional Service Canada) staff. She has conducted hundreds of interviews where she, among other things, assessed the impact of solitary confinement. She stated that: “the impact of being in solitary is significant, [it can] create trauma that extends well after their release into the community”. Questioning whether CSC staff are sufficiently trained to be able to deal with segregation, Dr. Moffat notes that given what we know about Indigenous people (the history of residential schools, intergenerational effects, etc. ), women, and corresponding trauma, it is clear that segregation is undoubtedly a traumatizing environment. Treatment by CSC and medical staff can further add to this trauma. “There are a lot of things that can happen to a person when they are in solitary confinement. Chemical restraints, such as psychotropic drugs or other drugs that have a numbing effect, are often used on prisoners.” Dr. Hannah-Moffat notes that these medications are disproportionally prescribed to women, often in order to make them more manageable on the unit. Canada argued that allowing prisoners to have their personal items with them in their segregation cells humanizes the environment. In response, Dr. Hannah-Moffat noted that the policy is that an inmate’s belongings should be provided to them, but this is not always what happens in a culture of compliance. 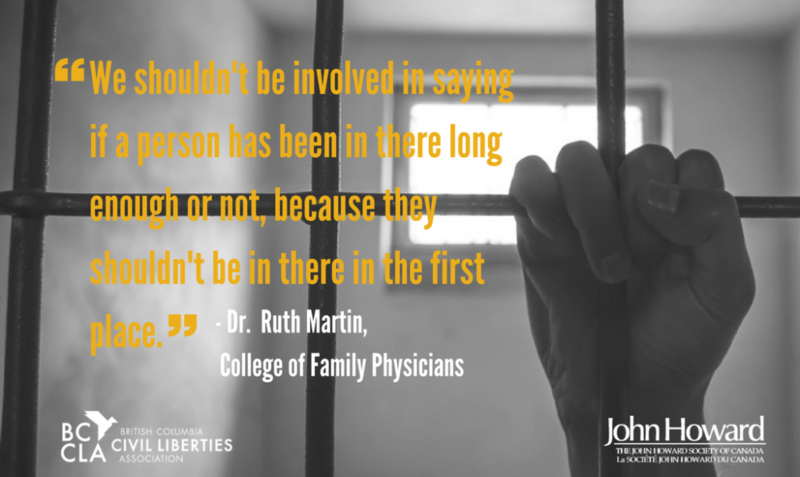 Expert Witness Dr. Ruth Martin appeared in court today to speak to the physical and mental health of prisoners, and the role of physicians and health care workers in prisons. Dr. Martin, in accordance with research completed at the College of Family Physicians, says that 22-24 hours without meaningful contact (the present practice for solitary confinement), should not exist within Canada. Until it can be abolished entirely, it should certainly be abolished for young people and those with mental health issues. 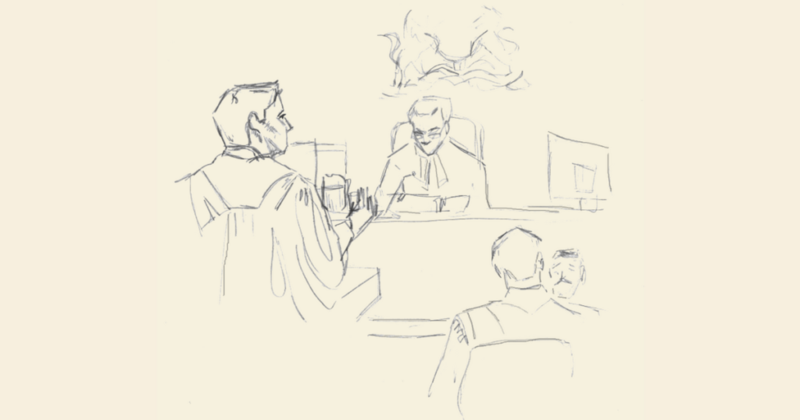 Counsel for Canada explained to the court that CSC (Correctional Service Canada) staff are provided with training in mental health and specifically, training that allows them to be knowledgeable about suicide and self-injurious behaviours. Dr. Martin commended CSC for providing this type of training, but noted that to her knowledge there are about 10 suicides that occur in federal institutions each year; there are many other mental health issues that need to be assessed and that should limit someone from admittance to segregation. Noting a particular issue with institutional mental health screening, Dr. Martin said that if there is a correctional officer doing the screening, it can be perceived differently by the offender than if it was done by someone who is trained in mental health and is not aligned with the institution. Several of the BC Civil Liberties lay witnesses have echoed this sentiment when giving their evidence. Bobby Lee Worm testified in court today to the over three and a half years she spent in solitary confinement in Canada’s federal penitentiaries. She echoed the above statement numerous times in response to counsel for the Attorney General suggesting that her account of the conditions of confinement in segregation were inaccurate. When shown a picture of a segregation cell with a window with a curtain on the inside (that could be controlled by the inmate), she replied that that was not the situation for her. They kept her curtain outside, only to be opened or closed if she made a special request to a supervisor. “That was their way of having another thing over me that was a privilege” she told the court. Ms. Worm also spoke to issues around access, to things like daily showers, visits from the institutional elder, and psychology sessions. She testified that while these things were offered with some regularity, if the unit happened to be too chaotic that day (from staff shortages, inmate transfers or suicide watches, for example) then the offers were not fulfilled. When these services and programs were available, she said, she would sometimes still decline because of the rigorous process involved in getting her out of her segregation cell. “Shackles. Handcuffs. I’d have to be backed out of the room and accompanied by three staff members. Some days I did not want to deal with the protocol. Sometimes I would decline showers because it would add more stress to what I was dealing with”. Following the cross-examination, BCCLA counsel Caily DiPuma asked Ms. Worm about the day she was finally released from solitary confinement. Ms. Worm said that it was the same day that she and the BCCLA launched her lawsuit against the Correctional Service of Canada over the conditions and length of her segregation. 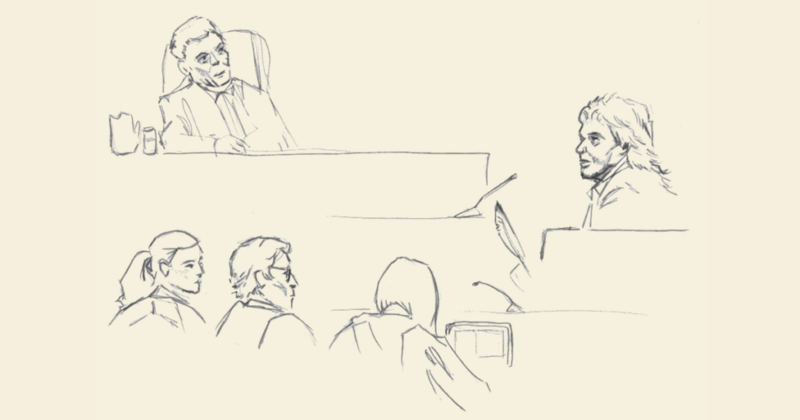 Today, BCCLA counsel Joe Arvay continued his cross-examination of Canada’s expert Dr. Paul Gendreau. A large focus of Dr. Gendreau’s expert evidence is his ‘meta-analysis’ work, meaning his review of other studies in order to get a more comprehensive view of the findings. Dr. Gendreau defended the findings of a key meta-analysis in which he concluded that the effects of administrative segregation were “small to moderate” and, crucially, “no greater than the negative effects of incarceration generally”. Counsel for the BCCLA, Mr. Arvay, suggested in his cross examination that this research in fact supported the proposition that prisoners in solitary confinement do fare worse than prisoners generally. Arvay’s challenge to Gendreau dealt with the comparison to the general experience of incarceration, which Gendreau eventually conceded was not supported in the meta-analysis itself. It was only in the discussion section of this research paper, which was Gendreau’s principal contribution to it, that the “faring no worse” conclusion was reached. Mitchell Taylor, Q.C., lead counsel for the Attorney General, concluded the day with a set of questions following Mr. Arvay’s cross examination. He confirmed that Dr. Gendreau’s evidence from yesterday was indeed that prisoners with serious mental illness should not be subjected to solitary confinement, and also that there should be a cap of 60 days. 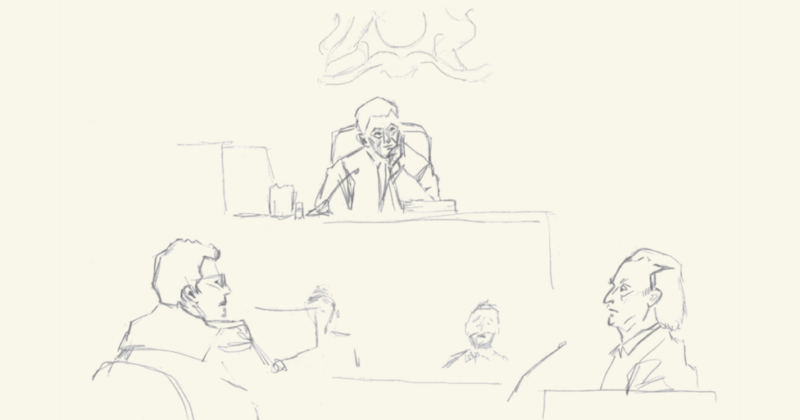 Mr. Taylor concluded his questioning by asking the court reporter to play back the part of the transcript where Dr. Gendreau agreed that the meta-analysis did not support the proposition that prisoners in solitary confinement fare no worse than other prisoners. It was confirmed in playback that Dr. Gendreau did agree to this. Today, counsel for the Attorney General called their first witness. Dr. Paul Gendreau was recognized by the court as an expert in psychology who is qualified to give opinions on the effects of solitary confinement and prison life in general on prisoners. Dr. Gendreau first confirmed that the last qualitative and quantitative studies he had personally conducted on the effects of solitary confinement were between 1969 and 1988. As part of his PhD, he spent a week in a solitary confinement cell in order to better understand the experience. 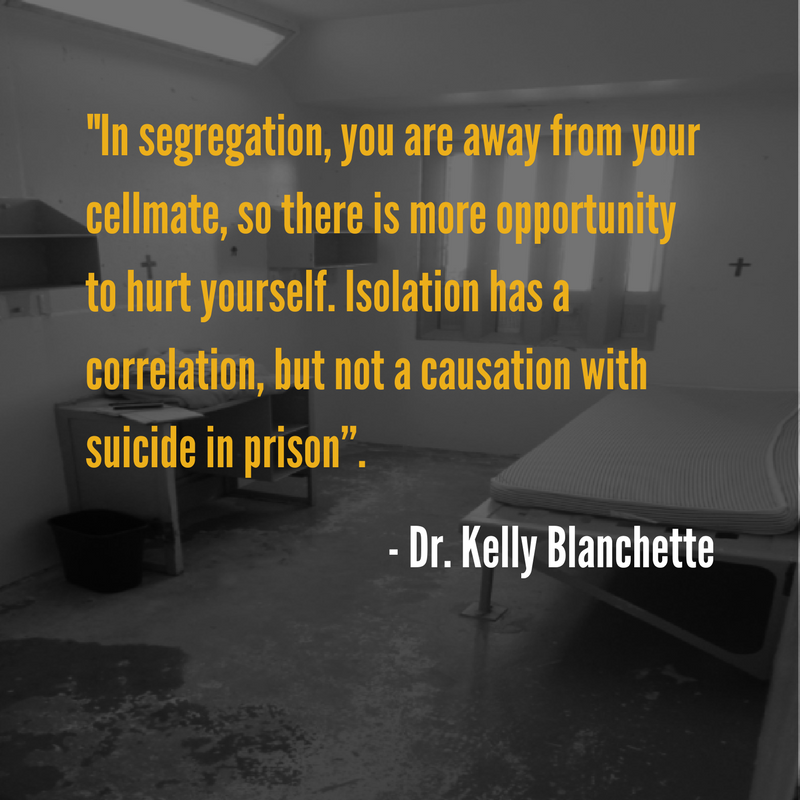 In his expert report, Dr. Gendreau expressed the opinion that there should be a general 60 day single placement limit on the use of solitary confinement, with an exception for those “exceedingly dangerous” prisoners who may merit placements of up to one year. When questioned on this point by Mr. Arvay, Dr. Gendreau suggested that approximately 5-10% of prisoners fit this category, and generally included those individuals whose behaviour posed “a serious threat to the good running of the institution”. Dr. Gendreau agreed, however, that for prisoners with serious mental health issues solitary confinement should never be used. Dr. Gendreau maintained throughout his examination that the harms of solitary confinement have not been studied well enough to be conclusively agreed upon. He suggested that current ethical guidelines make it impossible to conduct the “perfect study” in this area, and that “natural” studies (i.e. studying actual prisoners without imposing certain scientific parameters) were the best we could currently do. Mr. Arvay asked what Dr. Gendreau suggested as policy in the meantime, while prisoners continue to be subjected to solitary confinement. Gendreau replied that he is simply reluctant to go beyond the 60 day limit, given the current lack of empirical evidence. These documents included an alleged video of the altercation that Correctional Services Canada (CSC) claims was the initial reason for Mr. Andre Blair’s 363 day segregation. The BCCLA provided a lengthy affidavit with all available documentation on Mr. Blair because “we did not want to hide anything from the court”. Canada’s disclosure to the BCCLA included Offender Management System files on Mr. Blair. It appears that Canada did not simply find new information, but rather they held back the disclosure of important documents to the BCCLA. “The truth is, that inside of prison, many of the staff – they don’t treat the prisoners like human beings. Many of them have the view that these are terrible people, they always will be terrible people, and they don’t deserve to be treated like human beings. This is a systemic issue”. So testified Robert Clark, the witness called today by BCCLA counsel Alison Latimer. Mr. Clark was employed by the Correctional Service of Canada (CSC) for 30 years, working at all types of institutions as a segregation unit supervisor, an investigator, and a deputy warden (among other roles). He described the “blue wall” of CSC – an internal code which said you could never “rat” on another officer – as a core component of the organization’s culture. If an assault were to occur between an officer and an inmate, with only other officers to witness it, Clark claimed it would not be uncommon for correctional staff to side with each other regardless of the truth of the matter. He also testified that internal promotions, wherein it is typical for a warden or deputy warden to have once been a correctional officer, allowed this culture to flourish at every administrative level. It would be learned at the beginning of one’s career, and maintained throughout. Mr. Clark also spoke of the difficulty around accessing a lawyer for those held in solitary confinement, the deterioration of their capacity over long term segregation (often eventually sleeping 16 hours per day and spurning opportunities to interact with others), and the disproportionate number of mentally ill prisoners being subjected to these conditions. He said the culture of CSC contributed to these issues. Closing out her questions for Mr. Clark, Ms. Latimer asked if he believed it were possible for the culture of CSC to change on its own, without external influence. He replied no, saying that the negative aspects he testified to today were too heavily entrenched in the organization. Today, Mary Elizabeth Campbell was called upon to testify. Campbell is a retired lawyer, specializing in Canadian correctional law. She has described herself as engaging in “fearless inmate advocacy” and is dedicated to human rights for everyone, including prisoners. Canada finished forwarding more than 20,000 documents to the BCCLA team yesterday. These documents were intended to be included in the Canada’s documents for discovery, meaning that Canada intended to have these documents at their disposal throughout the trial. Alison Latimer, counsel for the BCCLA, asked Mr. Justice Peter Leask for a ruling on the 20,000 plus documents. Earlier in the trial, Joseph Arvay commented to the judge that making the BCCLA review this many documents, this late in the trial, is unfair and near impossible to do (because they are in trial every day). Justice Leask said the documents are “out”, meaning that the BCCLA does not have to review them, and Canada will not be able to rely on the information contained in those 20,000+ documents throughout the trial. The BCCLA expects that Canada will bring this issue up again tomorrow. The first inmate witnesses were called today. 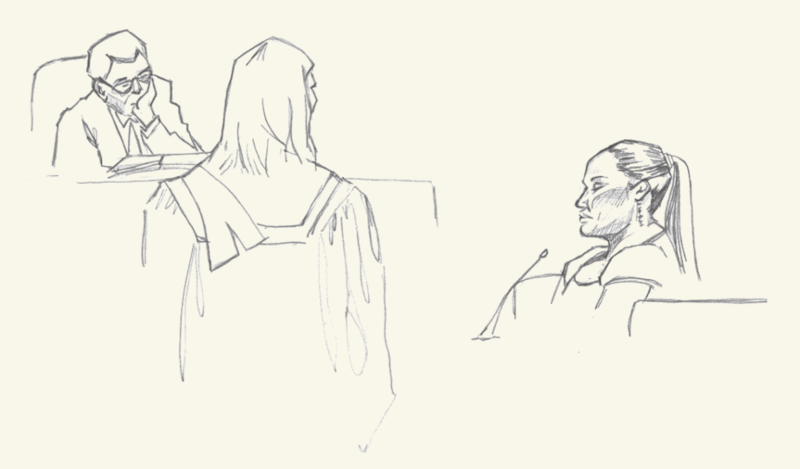 James Busch, who is currently incarcerated at Mission Institution, and Leslie Brownjohn, currently incarcerated at Pacific Institution, both spoke to the court about their experiences in solitary confinement at Canada’s federal penitentiaries. After BCCLA Counsel Alison Latimer Entered Mr. Busch’s affidavit into evidence, counsel for the Attorney General began their cross examination. When asked if he was advised of his right to counsel upon being placed in solitary confinement, Mr. Busch claimed that he was but that lawyers were infrequently available to handle such cases. He also spoke to psychological services being underfunded, with a waitlist of up to 6 months if you request services, and up to one month if your need is deemed dire. Mr. Busch said that, at one point, he refused to express his suicidal feelings to an available psychologist because he knew it would result in further restrictions on his liberty. Leslie Brownjohn’s evidence was also entered as an affidavit. During his cross examination he echoed several of the issues testified to by Mr. Busch, including the difficulty in accessing a lawyer. He testified that while a legal call would usually be offered, it was often after business hours (so nobody would pick up). Mr. Brownjohn also denied on several occasions that the reasons he was placed in solitary confinement were accurately recorded by prison staff. He testified, for example, that a threatening message and image found on his cell door and used to justify his placement was in fact there before he resided in that cell. He also spoke of the mandatory suicide needs assessment checklist, which is required as part of the admission to solitary, not being administered consistently. Sometimes, he said, he was asked if he felt suicidal, and sometimes he was not. Today, BCCLA introduced witness Dr. Stuart Grassian, a US psychiatrist, who has been practicing for about 40 years. His qualifications include extensive research, medical assessments, and interviews with prisoners in solitary confinement. While primarily working in the US, Dr. Grassian indicated that his research encompasses information from both Canada and the UK. Dr. Grassian has worked with people with both medical and psychiatric illness and presented on how these issues are exacerbated for prisoners in solitary confinement. Dr. Grassian gave testimony as to the prevalence of psychiatric syndrome (a severe illness affecting the brain or other parts of the body), and psychotic delirium, (which can develop in a host of medical situations), for segregated prisoners. Appearance of delirium in segregated prisoners showcases the impact of solitary confinement, and can also develop into more serious impairments and psychopathology. Canada crossing expert witness Professor Michael Jackson. Drawing by Catherine Hart. This morning, Canada requested clarification on a number of points from the BCCLA’s filed Notice of Civil Claim. Mr. Justice Peter Leask dismissed all of Canada’s requests, calling many “evidence, not pleadings”. A motion was made by the BCCLA to change the terminology in paragraph 18 of the Notice of Civil Claim. Pleadings will be finalized on Monday July 10, when the parties will determine if the BCCLA is able to change the wording of “target” to “disproportionate” to better represent the BCCLA’s position, and grant Canada clarification on the term. 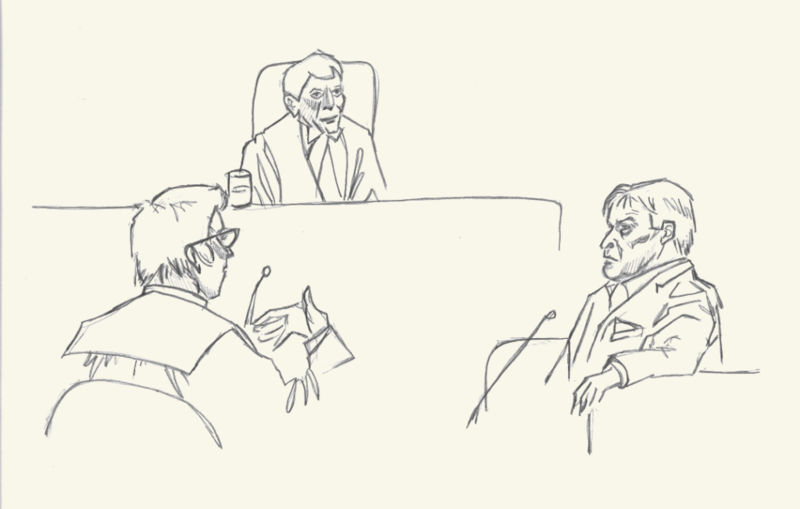 Canada’s voire dire on the expert testimony of Professor Michael Jackson wrapped up this morning, and continued with his cross examination by Canada. Professor Jackson elaborated on some of the alternatives to segregation such as smaller, more selective residence ranges. On the issue of prisoners refusing to leave segregation, Professor Jackson commented that when prisoners are faced with the option of moving to another prison, far away from family, or returning to an unsafe general population, there is hardly any option at all. Commenting on Correctional Services Canada (CSC), Professor Jackson acknowledged that CSC has a very tough job, and they need to have more options available to them to keep people separate from the general population after an incident. Cells need to be developed that will accommodate a different type of segregation. When you only have two options (general population and segregation), there really is no option. Today, Professor Michael Jackson was called as an expert witness. After BCCLA Counsel Joesph Arvay examined Professor Jackson on the content of his resume and qualified him as an expert to the court, counsel for the Attorney General began their voire dire on his expert evidence (arguments that his evidence should be excluded). When asked about his empirical research methods, Professor Jackson stated that he has in the past been given unprecedented levels of access to Federal Prisons in Canada. While researching his 2001 book Justice Behind the Walls, he was able to walk freely around prisons, meeting with both prisoners and wardens. Informed by this access and his other research, he spoke also about the “dissonance” between law/policy and practice in Canadian prisons. “When you look at the law” he said, “The Canadian system looks like the best in the world – but you have to look at what actually happens”. He told the court that this dissonance is in fact part of what inspired him to write Justice Behind the Walls. Mr. Justice Peter Leask ruled at the end of the day that Professor Jackson can be accepted as an expert in this case on all aspects of incarceration, including international human rights standards applicable to prisoners and prison administration and current Canadian prison law and policy, with specific expertise on the use of expertise in Canadian prisons. Justice Leask also ruled that Professor Jackson could present factual evidence (not as an expert) on things he has observed through the course of his research, including on his perception as a layperson of the effects of solitary confinement on the prisoners he has interviewed over the years. Mr. Justice Peter Leask (top left), BCCLA counsel Alison Latimer, Joe Arvay, Q.C., and Caily DiPuma (bottom left, L-R) and Glenn Patterson (far right). Drawing by Catherine Hart. 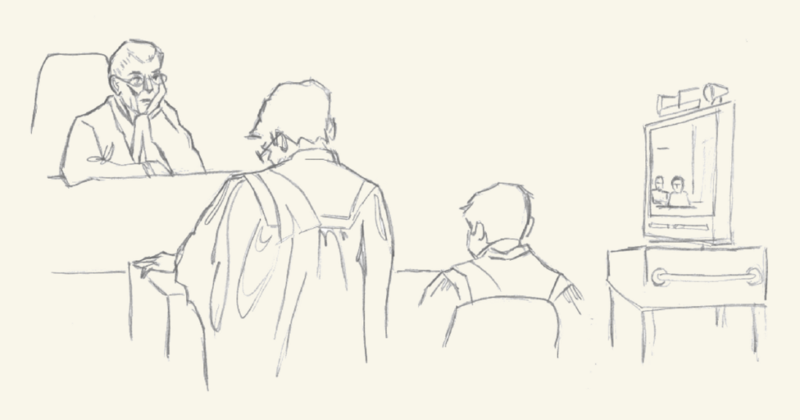 Today, the first witnesses were called upon to testify. The court heard first from Glenn Patterson, a former Indigenous cultural advisor at various Federal prisons and institutional elder at Matsqui Penitentiary. In these roles he offered spiritual and cultural support to Indigenous prisoners, including those who were being held in solitary confinement. He said that, once prisoners in the solitary wing became aware that he was visiting, they would yell down the corridor for him to come and visit them. 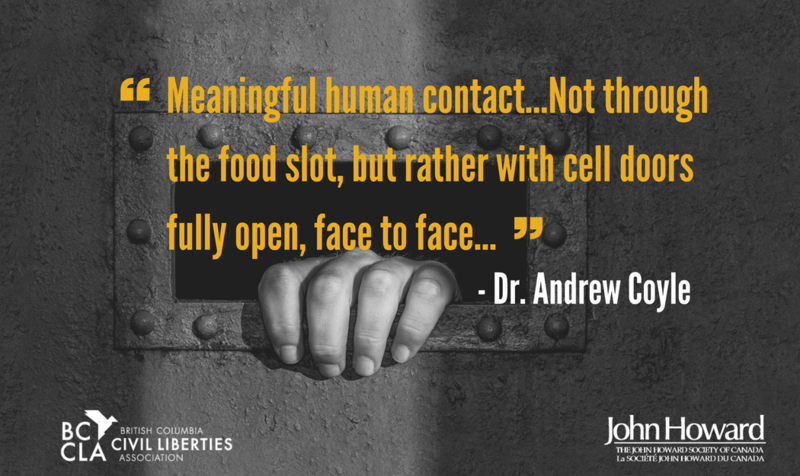 He spoke of having to meet with prisoners through the 18 by 4 inch food slot in their cell door, and how, against the advice of the correctional officers on site, he would often reach his hand through that slot in order to create some human contact with the person on the other side. In answer to a question from Mr. Justice Peter Leask about whether he ever felt afraid of the prisoners, Mr. Patterson replied that he did not. He also told the story of Kevin Stonechild, an aboriginal inmate who in 2000 committed suicide while being held in solitary. Mr. Patterson told the court about a meeting he had with Mr. Stonechild the day before his death, during which he was “terribly distressed about his life”. Mr. Patterson told both Correctional Officers and health staff about his concerns following the meeting, but Mr. Stonechild was still able to take his own life the following day. The court also heard from Rob Roy, the father of Christopher Roy, who killed himself while being held in solitary confinement in 2015. The bulk of Mr. Roy’s evidence was given to the court in the form of an affidavit, after which he was briefly cross examined by Canada about his depth of knowledge concerning the reasons his son was being held in solitary confinement. At the end of the examination, Justice Leask thanked Mr. Roy for his testimony, saying “it must be troubling for you”. Canada counsel Edward Burnet (left), Justice Leask (second from left), Canada counsel Matt Huculak (second from right), and transcriber (right). Drawing by Catherine Hart. 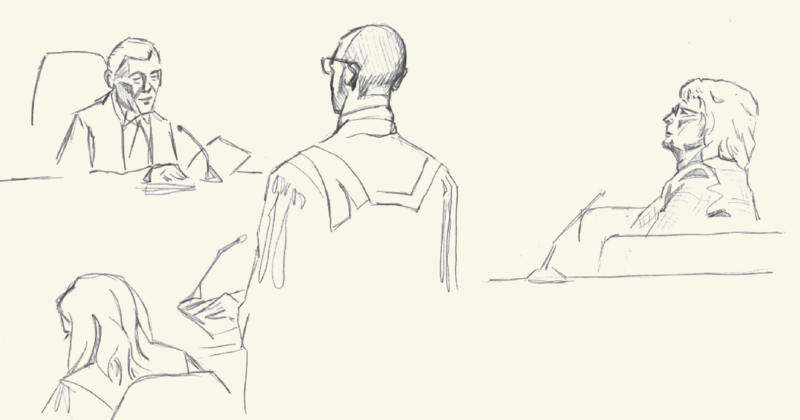 Opening arguments were heard today in the landmark solitary confinement trial launched in January 2015 by the BC Civil Liberties Association (BCCLA) and John Howard Society of Canada (JHSC). BCCLA’s pro bono counsel Joseph Arvay, Q.C. opened the 9 week trial by telling the story of Ashley Smith, calling her death in solitary confinement a major impetus for the lawsuit. He described the conditions of deprivation under which Ms. Smith suffered, and her admission to a care worker about wanting to end her life just prior to doing so. Mr. Arvay told the court about how the recommendations arising from the report about Ashley Smith’s death, recommendations concerning strict time limits and binding independent oversight, were rejected by the Correctional Service of Canada (CSC). He then presented a series of photographs showing the inside of segregation cells across Federal penitentiaries, stating at the last that they were “not a place I’d like to spend more than a few minutes, much less weeks, months, or years”. Mr. Arvay also introduced the evidence the court could expect to hear in the coming weeks. He spoke of experts that will testify to the severe psychological trauma inflicted by prolonged and indefinite periods of isolation. He spoke of former CSC employees who will testify to the “blue wall” of corrections – a workplace culture that values solidarity at all costs, is highly resistant to outside interference, that often sees prisoners as “less than human”, and which has shown a long standing pattern of disrespect for the rule of law. He said that the evidence will show what can happen when such an institution is granted broad, unfettered discretion, and the bitter resentment towards authority and law that is engendered in prisoners who are subject to such discretion. Mr. Arvay concluded by addressing the recently tabled Bill C‑56 and the proposed new Commissioner’s Directives, both of which were released just two weeks before trial. He argued that, while not Charter compliant on their own, the presumptive limits set out in these documents amount to a concession by the Attorney General that the current laws are in fact not constitutional. Mitchell Taylor, Q.C. opened in defense for the Attorney General of Canada by arguing that administrative segregation, as Correctional Service Canada refers to it, is a necessary and appropriate tool that is only used in prescribed circumstances when there are no other alternatives. He went on to argue that the BCCLA and JHSC have not identified any prisoners who are currently complaining about the use of this tool, telling the court to expect only evidence of past instances that are, in any event, isolated in nature and not indicative of systemic abuse. He provided as an example the 2014‑2015 Office of the Correctional Investigators Report as an outdated piece of evidence. 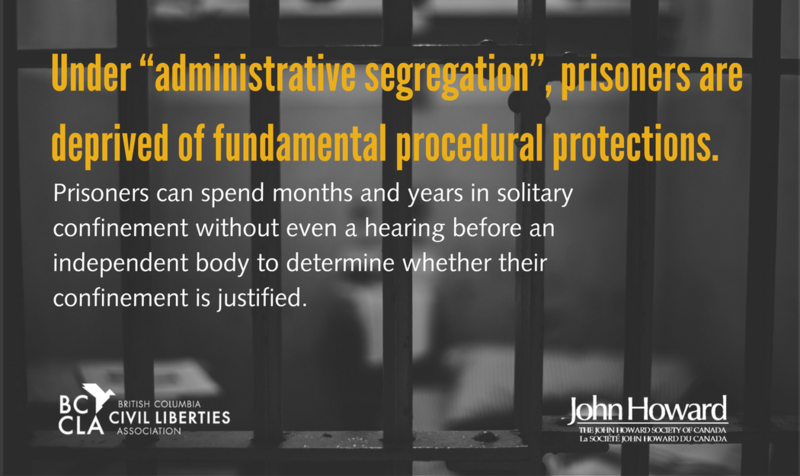 Mr. Taylor spoke to the purposes of segregation as outlined in the current legislation – namely that it is used to protect the safety and security of the institution and for the least possible amount of time. He argued that the evidence tendered by both parties should be tested in relation to these provisions, which the Attorney General maintains are constitutional. Mr. Taylor then outlined three categories of witnesses: CSC employees who will speak to the challenges and risks of correctional work, experts who will respond to the expert evidence brought by the BCCLA and JHSC, and senior CSC officials who will provide evidence that administrative segregation is both necessary and effective when used appropriately. The first day in court for this historic trial ended with discussion of some procedural matters. Most notably, Mr. Arvay argued that the 20,000 documents that Canada has provided lists of to the plaintiffs (but not the documents themselves) in the final days before trial should be excluded as evidence, on the basis that their production at the final hour is unfair in the extreme and an abuse of court process. Mr. Justice Peter Leask declined to rule on this, reserving his judgment for tomorrow when further arguments could be heard. Next Post: We’re Hiring! Join us as our Director of Community Engagement!